lllinois Gov. Bruce Rauner speaks about the state of Illinois' economy at Richland Community College in Decatur Ill., during a stop to preview his State of the State address on Feb. 3, 2015 in Springfield. The contracts for more than 40,000 Illinois state workers will expire at the end of the month, and their unions and Republican Gov. 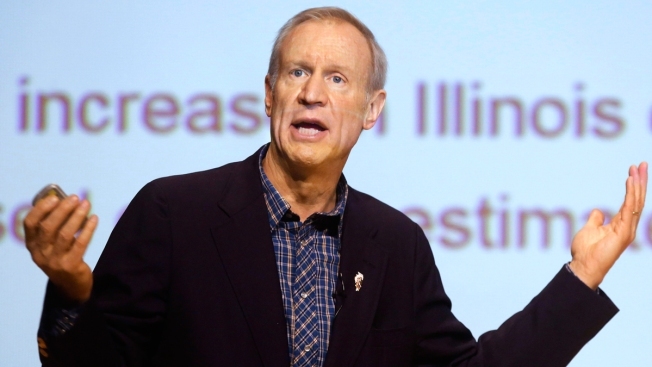 Bruce Rauner's negotiating team apparently aren't close to agreeing on new ones. The state's contracts with the American Federation of State, County and Municipal Employees, the state's largest public employee union representing roughly 36,000 state workers, and those with roughly two dozen smaller unions representing roughly 5,000 nurses, police officers and others expire June 30. Although they have been negotiating new pacts for six months, the sides remain far apart on several key issues, including wage increases, health insurance costs, the promotion process and how overtime pay is calculated. Rauner has said little publicly about the status of negotiations. But AFSCME Council 31 Executive Director Roberta Lynch indicated they're not going well, telling members in a letter last month that Rauner had indicated he planned to "force a strike and shut down state government" until the union agrees to his terms. In response to Lynch's allegations, Rauner spokeswoman Catherine Kelly told The Associated Press that the governor's "negotiating team is committed to bargaining in good faith with the government unions to reach a deal that is fair to employees and taxpayers." If agreements can't be reached in time, it's possible that the unions and Rauner could agree on contract extensions of several months to help facilitate negotiations under a less-pressurized setting, as has happened under past governors, including Rauner's predecessor, Democratic Gov. Pat Quinn. If not, a strike or lockout could occur. AFSCME spokesman Anders Lindall said the union is committed to "doing the work required at the table" to reach an agreement, and that a strike "is not in the public interest." Rauner, who has called for allowing cities to create union-free zones to attract development and has proposed an end to prevailing-wage laws, hasn't gone that far. Kelly said that "as long as AFSCME is committed to bargaining in good faith, we are confident we can reach a contract by the deadline that benefits state workers and the taxpayers." Without a contract in place, many unionized state workers would be allowed to vote to strike and walk off their jobs, though Lindall said that hasn't happened in Illinois history. That includes caseworkers at the Department of Children and Family Services, and home health care workers, among others. State agencies like the Department of Human Services and Secretary of State's office could shut down. Without a contract, Rauner would also be able to lock out workers from their jobs. Eyeing the possibility of a strike, lawmakers in the Democratic-led Legislature late last month approved a bill that would prohibit state workers from going on strike or being locked out of their jobs by the administration if negotiations on a new contract reach an impasse. Under current law, only prison guards and other public safety workers are barred from striking. The proposal would allow either side in labor talks to declare an impasse, starting a process in which the contract would be sent to binding arbitration. Rauner's attorneys have said that they believe the legislation would "change the nature of collective bargaining." The governor is expected to veto the bill. Kelly said "the administration is not going to lock out employees and our team will continue to negotiate in good faith. If AFSCME members decide to strike, it will show they are placing their personal interests above the people they serve." History shows a mixed bag in terms of negotiations with past governors. In 2004, Democratic Gov. Rod Blagojevich signed off on a 13 percent wage hike over the course of a four-year AFSCME contract which union leaders called the best deal in the country at the time. Blagojevich approved another contract with the union in 2008 that included average annual raises of roughly 4 percent. Quinn's negotiations with the unions were tougher. After 11 months of bargaining sessions, the Democratic governor moved to terminate the state's extended contract with the unions. The administration had been seeking a pay cut for state workers followed by a wage freeze. It also sought to have employees pay more for health insurance. Three months later, an agreement was reached giving employees a 2 percent wage increase in the final two years of their contract, but also requiring workers to pay more for health insurance.